Yesterday I spent the day in Springfield with a group from Martinsville on the Move. We were there to receive 'The Governor's Hometown Award' for Martinsville. What a wonderful tribute to those like Norma Calvert, Florence & Jason Conner, Linda VonBehren, and George & Becky Greenwell who had vision and persistence in following that vision to improve our city! It was awarded to Martinsville because of the huge amount of hours given by the amazing volunteers at the Changing Hands Resale Shoppe, and because of other projects & volunteer work sponsored by Martinsville on the Move. There were 5 awards given to cities in each of 6 divisions which were determined by size of population. We also won First Place in our division. The first place winners were then entered in the final competition for the Governor's Cup. East St. Louis won the Governor's Cup but we felt it was quite an honor to even be in the competition. One of the judges walked out of the Governor's mansion with us at the end of the program and shared with us that she was so impressed with what Martinsville on the Move was doing and that we actually were near the top in the final competition. Amazing, isn't it!! Our little town of Martinsville, population of about 1200, really IS on the MOVE! I especially enjoyed hearing about the projects of the other cities who won the awards. All were inspirational and many were ideas to consider as projects for our town. All in all it was a very interesting and exciting day! It is time for holiness to return to the church. Today it is difficult to tell the church from the rest of the world. The divorce rate of Christians is the same (or higher) than that of the rest of the world. We hear reports almost daily of pastors who have fallen into sin and there doesn't even seem to be an outcry against it. What ever happened to holiness? What about repentance with Godly sorrow? Do we really fear God? Have we decided He doesn't mean what He says in the Bible--that it only contains "suggestions" for living instead of His righteous laws? Why aren't we ashamed of tarnishing the Name of Christ? We often believe a person is spiritual when he displays 'gifts of the Spirit' but it is 'fruit of the Spirit' that defines a Christian. Matthew 7 points out that many who operate in 'the gifts' will not inherit the kingdom. Then how are we to determine which ministries are representative of the Kingdom of God? In this excerpt from John Paul Jackson's November newsletter, he talks about the fruit of a Christ-like life and what we are to look for in evaluating ministries. I appreciate his wisdom. You can read the entire newsletter here, if you're interested. Why isn't this published by the media so everyone can know that Barack Obama's bailout of GM is benefitting only China with our tax dollars? If the media won't get the word out, we must. Please tell your friends & family. Get everyone to watch this video. China is going to own our country's assets without even firing a shot. It looks as if they are well on their way! This great list sent by our friend, Greg, arrived in my mail box this morning. It is worth posting and reading several times. We take ourselves, & life, much too seriously as far as 'ought to's" and forget to really live. Let's determine to have an attitude of gratitude and live life to the fullest, making the best of every situation, enjoying the people God sends our way. We only live once. What a tragedy to get to the end and realize we really didn't LIVE--we just existed! I wasn't planning to post anything else about the election, but this is such a good analysis and commentary on the results of--and the reasons for the results--of the election that it seemed one more post couldn't hurt. We accurately foresaw the enthusiasm, the passion, the commitment, the determination, and the turnout. Married women, men, independents, Catholics, evangelicals – they all went for Romney in percentages as high as, or higher than, the groups which voted for McCain in 2008. It wasn’t enough. What we saw in the election on Tuesday was a tipping point: we are now at a place where there are legitimately fewer Americans who desire a free republic with a free people than there are those who think the government should give them stuff. There are fewer of us who believe in the value of free exchange and free enterprise. There are fewer of us who do not wish to demonize successful people in order to justify taking from them. For the moment we are outnumbered. It’s just that simple. We have been trying to fight this battle every four years at the voting booth. It is long past time we admit that that is not where the battle really is. We abdicated control of the culture – starting back in the 1960s. And now our largest primary social institutions – education, the media, Hollywood (entertainment) have become really nothing more than an assembly line for cranking out reliable little Leftists. Furthermore, we have allowed the government to undermine the institutions that instill good character – marriage, the family, communities, schools, our churches. So, here we are, at least two full generations later – we are reaping what we have sown. It took nearly fifty years to get here; it will take another fifty years to get back. But it starts with the determination to reclaim education, the media, and the entertainment business. If we fail to do that, we can kiss every election goodbye from here on out. And much more. The real loser in this election was adulthood: Maturity. Responsibility. The understanding that liberty must be accompanied by self-restraint. Obama is a spoiled child, and the behavior and language of his followers and their advertisements throughout the campaign makes it clear how many of them are, as well. Romney is a grown-up. Romney should have won. Those of us who expected him to win assumed that voters would act like grownups. Because if we were a nation of grownups, he would have won. What is tragic is that tens of millions of children have lost their lives while Americans figure out what should have been obvious before. I have to laugh – bitterly – when I read conservative pundits trying to assure us that Obama “has to know” that he does not have a mandate, and so he will have to govern from the middle. I don’t know what they’re smoking. Obama does not care that he does not have a mandate. He does not view himself as being elected (much less re-elected) to represent individuals. He views himself as having been re-elected to complete the “fundamental transformation” of America, the basic structure of which he despises. Expect much more of the same – largely the complete disregard of the will of half the American public, his willingness to rule by executive order, and the utter inability of another divided Congress to rein him in. Stanley Kurtz has it all laid out. Too strong? I don’t think so. I have been watching the media try to throw elections since at least the early 1990s. In 2008 and again this year, we saw the media cravenly cover up for the incompetence and deceit of this President, while demonizing a good, honorable and decent man with lies and smears. This is on top of the daily barrage of insults that conservatives (and by that I mean the electorate, not the politicians) must endure at the hands of this arrogant bunch of elitist snobs. Bias is one thing. What we observed with Benghazi was professional malpractice and fraud. They need to go. Republicans, Libertarians and other conservatives need to be prepared to play hardball with the Pravdapress from here on out. And while we are at it, to defend those journalists of whatever political stripe (Jake Tapper, Sharyl Atkisson, Eli Lake) who actually do their jobs. As well as Fox News and talk radio. Because you can fully expect a re-elected Obama to try to reinstate the Fairness Doctrine in term 2. What that means, I fear, is that they will not see what is coming until the whole thing collapses. That is what makes me so sad today. I see the country I love headed toward its own “rock bottom,” and I cannot seem to reach those who are taking it there. Since our ceiling is so high in the living room, I love getting the tallest tree I can find each year. This year, though, 10 feet seemed to be the tallest, and then our daughter called to say they would be coming after New Year's instead of at Christmas. Since I usually take the tree down right after Christmas, I just couldn't get excited about putting up a tree that wasn't as tall as I wanted and that wouldn't be enjoyed by many people. I then decided I would set the small artificial tree (already decorated) that I usually use in the window over the entryway on a table and call the house 'ready for Christmas'. I couldn't seem to resist getting out some of the decorations I enjoy, though. 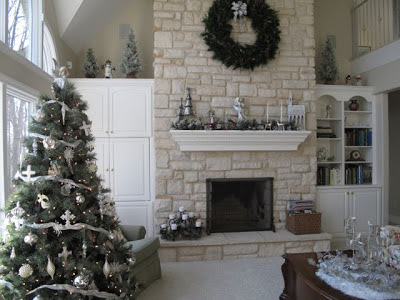 As I began to arrange them I seemed inclined to use the silver and white things and frosted garland on the mantle over the fireplace in the living room. That looked so pretty! But then the little red & gold decorated artificial tree looked so out of place and the plant shelf over the entry looked so bare! I decided I might as well put the little tree in its usual place and find something else for the living room. 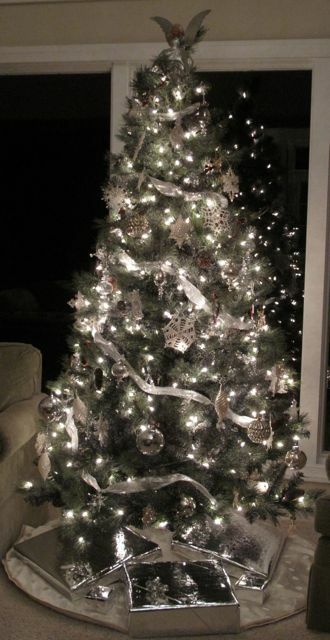 Country Guy and I decided to go shopping--on Black Friday no less--to see if we could find a 7 or 8 foot artificial tree that we could decorate with silver, sparkles, and glass this year and then use it in the basement in coming years. We found a beautiful 7 foot pre-lit tree at Menard's, called Arctic Frost, which looks very real and was the most reasonably priced of any we looked at, so we were excited! Sydney & Owen spent the night Saturday. We had a great time decorating the tree and we're thrilled at how beautiful it turned out. I'm including a photo (which doesn't do the tree justice) so you can get an idea of what I'm talking about. I guess I should have taken the picture before the sun shone through the window but then I wasn't thinking about writing about it last night! God’s Word is filled with warning labels, alerting us to things that are harmful to our spiritual health. When we read, “These six things the Lord hates, yes, seven are an abomination to Him” (Prov. 6:16), it grabs our attention like a flashing warning signal. The list that follows (vv.17-19) warns against destructive tendencies like pride and dishonesty—sins that damage earthly relationships and grieve our heavenly Father. The text further states that “reproofs of instruction are the way of life” (v.23). In other words, God’s warnings aren’t meant to take the fun out of life, but rather to protect and preserve life. I’ll always remember as a child standing with my friend Bobby outside after church and watching him suddenly run toward the busy street. I heard his mother yell, “Stop!” It was a warning to protect him, not to hinder his freedom. Too often we’ve ignored God’s warnings to stop running in the wrong direction and suffered the consequences. Let’s remember that there’s freedom in heeding His warnings. They’re for our good. that are intended to protect and preserve my life. that I may live a life that is pleasing to You. to protect and preserve us. I love Mychal Massie's blog. He is practical, passionate and bold in speaking the truth. He says so many things most people believe but are afraid of being called racist and intolerant if they spoke them openly. Since he is black he has a little more leeway to say them but it certainly takes courage for him to go against popular opinion--or at least the opinion the liberal media says we're supposed to have. I firmly believe we have been intimidated into silence by those who don't want the truth spoken. We must reclaim our right to free speech and to disagree with those who hold values contrary to the principles our country was founded upon. That is one reason I post articles like this one with which I totally agree--they say what I would like to say so much better than I can. Here is another post (which is actually a repost) that I found insightful and true. The following is a syndicated article written by me and published May 16, 2006. 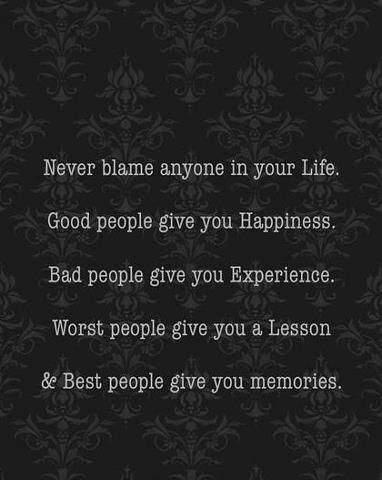 To merely suggest that there is an abundance of wisdom contained in that 21-word sentence is a gross understatement. And nowhere at present is its truth more evident than in the mishandling of the illegal immigrant situation. Just as radical Islam is not a religion, it is a murderous cult of unparalleled evil, and just as abortion is not about choice, but the selfish, paganistic murder of innocent unborn children, illegals are not simply nice migratory agrarians searching for a better life. They are criminals, they are dishonest and they are usurpers, ultimately controlled by those with a political agenda. Jimmy Carter’s ineptness and treachery led to the unleashing of Islamic terrorism in the modern civilized world. Bill Clinton’s non-responsiveness after the World Trade Center bombings in 1993 gave rise to the bombings of American interests around the world and resulted in Sept. 11. President Bush’s coddling of Islam as a peaceful religion has been evidenced by beheadings, Fallujah and manipulative attacks against journalists and talk-program hosts by the Council on American-Islamic Relations. A boot on the throat of Islamic fundamentalism and the conviction to challenge groups like CAIR would have spared America and her citizens much pain. However, our government and far too many citizens – having learned nothing from history – played pity-pat with the devil to our harm. As I continue to point out, we now capitulate to illegal aliens at the risk of the destruction of our way of life. We must be inflexible hardliners when it comes to defending and enforcing immigration laws and when it comes to defending our borders. One primary reason is, as Mark Krikorian, executive director of the Center for Immigration Studies correctly points out: “We cannot allow illegals turned legal into a well-developed welfare state.” Doing so would create a fatal, debilitative drain on the middle class. Internal Revenue Service figures show the bottom 50 percent of wage earners paid 3.46 percent of all income taxes in 2003. Yet we know they consumed the greatest amount of government sponsored aid and entitlements. This group is comprised of couples filing jointly who earned less than $29,019 in that same year. Illegals are already consuming tremendous amounts of unwarranted government subsidies provided at taxpayer expense. Then factor in the additional monetary drain that would be associated with over 12 million illegals suddenly given carte blanche access to federal programs such as Medicaid, Section-8 housing, and food-assistance programs. Many of them already freely enjoy the benefits of programs like WIC (Women, Infants and Children). It is an undeniable fact that the majority of illegals are – at best – poorly educated, low-income workers. And if this single fact is to be disputed, then there remains no supportive argument for those who claim illegals do the work Americans won’t do. But I get ahead of myself. There is a reason that legal immigration has been strictly regulated – maintaining strict limits on how many unskilled, skilled and professional immigrant applicants were admitted each year. Accordingly, how will creating another dependent class better America? What will creating another dependent class do to the already supposedly strained resources of the middle class? Americans sat on their voices pursuant to the homosexual agenda until we were confronted with the redefining of marriage. Americans were passively ambivalent pursuant to liberal socialist judges, until Kelo vs. Connecticut opened the door for private property to be seized and given to private industry. America cannot afford to applaud the president for a promise to strengthen our borders, without a specifically defined way to repatriate the illegal aliens residing within our borders – no matter how long they have been here. If history has repeatedly taught one thing, it is that there are instances where hostile belligerence and indifference on our part is not only acceptable – it is in the interest of our secure well-being to be nothing less. This is a seminal moment pursuant to the future of our culture. We cannot afford to be nice. We can only afford to preserve our nation as one with liberty and justice for all legal citizens – not criminal vagabonds who bully their way in. Are you reading the New Testament in chronological order with me? Weren't you amazed this morning how well Paul described the disdain for God and the resulting lawlessness that is rampant in our country today in Romans 1? In case you haven't had time to read it, I'll insert it here. I usually read the NIV version but after being so amazed at how accurate the description was, I looked it up in The Message, too. Revival is our only hope! Some people are so creative, aren't they? 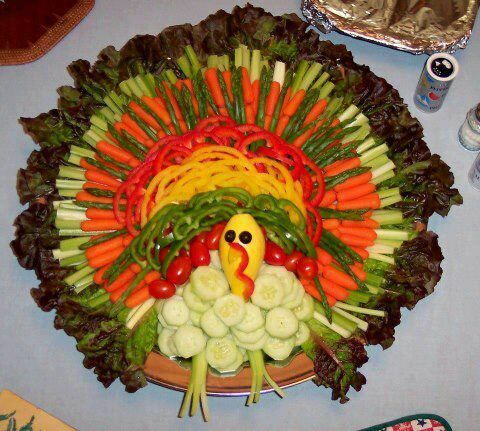 Who would ever think of making a turkey out of vegetables? This story was quite an encouragement to those of us who want to be used by the Lord to speak encouraging, edifying and comforting words to all who need to know God loves them. It is not up to u to decide if the word is important enough in our eyes to give. Joni Ames said she was on a team of people under the leadership of Rick Joyner who were being trained in the prophetic This team was ministering at a conference and were given the instructions to look around at the participants of the conference to see if God highlights one in particular to you and then ask Him for a word for that person. Then go give it to him/her. She said one lady, in particular, stood out to her, but the only thing she heard to tell her was that "God loves her." She thought that was a generic thing to say, that she obviously wasn't hearing God clearly, and kept asking for Him to give her a "word" for the woman. When she didn't hear anything else she decided she had been wrong and therefore wouldn't speak something so simple. Anyone could speak that kind of word to her. Rick came to the microphone and said there was someone on his team who had a word for someone but was not giving it because they didn't think it was good enough. He said God had told him if the person wasn't faithful in the little, He couldn't give the much. Joni knew he was speaking about her and since she wanted "much" from God she would give the word even if she did feel ridiculous giving such a short simple word. She walked up to the woman and told her "God loves you." When she said it the woman collapsed onto the floor in sobs and wailing. When she finally calmed down, she told Joni her story. She said she had to travel over a large bridge to get to the conference. When she crossed the bridge she said to herself that if someone didn't tell her at this conference that "God loves you", she was going to jump off this bridge on the way home. Her life was saved by three simple words! What an amazing story! How important to be obedient to speak words of encouragement to others! They may change a life! Joni Ames told an amazing story at the conference last weekend. She said she was in Birmingham, AL, at the request of an Episcopal priest. During the day she had agreed to see people on an individual basis to give them a prophetic word. A priest who knew she was in town, but not connected to the church where she was ministering, called to see if she would pray with a young woman from his church. She readily agreed to see her. The room she was ministering in was in the basement. As this lady came down the stairs the advertising jingle, "You see Libby, Libby, Libby on the label, label, label, etc." popped into her head. She said she dismissed it and told herself to get down to business. It was very obvious the young woman was pregnant. As she sat down the advertising jingle popped into her head again so Joni decided she would tell it to the young woman who had told her nothing about herself or her reason for coming. When she mentioned the Libby, Libby, Libby ditty the woman nodded as if to encourage her to continue. As soon as she told her the song, a picture popped into Joni's head of a table set with 3 plates, cups and spoons and Jesus standing there sweeping his arm toward the lady as He said, "you can have this if you want it." As Joni said that to the young woman her face lit up with a smile. She said, "Thank you," and left without saying anything else. Joni thought that was really unusual, but then forgot about it as others came for ministry. The next year when she was at the same church someone asked her if she had heard the story of the young pregnant woman she had prayed with last year. Joni said no, she knew nothing about her. The person proceeded to tell her the woman was pregnant with triplets but the doctor had said one of them was not growing and was causing problems with the pregnancy and her health, so he recommended "selective reduction" by removing the child that wasn't healthy to enable the other two to come to term. He said, though, there was no guarantee that could be done without harming the other two and might terminate the pregnancy. The young woman didn't know what to do and had gone to her pastor who knew Joni was in town. He sent her there in hopes Joni would hear a word from the Lord for her. The young woman's name was unusual so they had always called her "Libby". When Joni told her the picture she saw, Libby knew that Jesus was offering her all three babies. She left knowing what she would do--she would keep all 3 babies. Within 2 weeks all the babies were the same size and she carried all three healthy babies to term. Five years later when Joni was again in Birmingham, she was told a lady with her children wanted meet her. When they came in the children ran to her, hugging her and calling her Grandma. The lady said she didn't know why they did that, she had not told them to. They said, "But Mom remember the dream we had with the lady in it and Jesus told us that was our grandma. This is the lady in the dream." Those were the triplets saved because of a word from the Lord delivered by a woman who didn't understand what she was hearing but was obedient to speak it. Isn't that an amazing story!! Have you ever wondered why many churches don't talk about the gifts of the Spirit? I have. It seems to me they are not preaching the full gospel and are in danger of falling into the category of "having a form of godliness but denying the power" that II Tim. 3:5 speaks of and warns us to stay away from, if they don't include the fact that Jesus died not only to make a way for us to go to Heaven, but also to give us His Holy Spirit to live in us here on earth. The Holy Spirit manifests in us in different ways and at different times as "gifts of the Spirit." In 1 Cor. 12, Paul says, 7 "Now to each one the manifestation of the Spirit is given for the common good. 8 To one there is given through the Spirit a message of wisdom, to another a message of knowledge by means of the same Spirit, 9 to another faith by the same Spirit, to another gifts of healing by that one Spirit, 10 to another miraculous powers, to another prophecy, to another distinguishing between spirits, to another speaking in different kinds of tongues, and to still another the interpretation of tongues. 11 All these are the work of one and the same Spirit, and he distributes them to each one, just as he determines." Paul goes on to say in verse 27 "Now you are the body of Christ, and each one of you is a part of it. 28 And God has placed in the church first of all apostles, second prophets, third teachers, then miracles, then gifts of healing, of helping, of guidance, and of different kinds of tongues. 29 Are all apostles? Are all prophets? Are all teachers? Do all work miracles? 30 Do all have gifts of healing? Do all speak in tongues? Do all interpret? 31 Now eagerly desire the greater gifts." Obviously Paul believes the gifts of the Spirit are for the church. He continues speaking of gifts of the Spirit in chapters 13 and 14 of 1 Corinthians. He ends chapter 14 with these words, 39 "Therefore, my brothers and sisters, be eager to prophesy, and do not forbid speaking in tongues. 40 But everything should be done in a fitting and orderly way." I believe that people are going to begin to flock to those churches who believe and preach the whole gospel because as times get even worse God will be their only hope. People are looking for a power greater than themselves. They see that if the supernatural is not welcomed then our religion becomes "something we can do for ourselves"--having a form of godliness but denying the power. All the gifts are important to the Body of Christ. We are in need of hope which comes from demonstrations of power through the operation of the gifts of the Spirit. We live in discouraging and frightening times which we are constantly reminded of by the media as they bombard us daily with bad news. Right now, though, I am particularly interested in learning more about prophecy which is given for the encouragement, edification and comfort of the Body. As Dale Gentry says," Just one word from the Lord can change your life forever." How needed this gift is today! That's one reason we went to the conference at the Wabash Valley International House of Prayer last weekend with Joni Ames. There we heard some incredible stories of how prophecy worked to change the lives of those she ministered to. I will share a couple of them with you tomorrow. God's word says that He will bless those who bless Israel and curse those who curse them. I believe it is important for all of us to understand this and to help others see what is going on in the news media to predispose us to side with the Arab world. We must educate ourselves. It is imperative our country stands with Israel. I believe there is a supernatural hatred of Israel and it is manifesting like never before. Let's take a look at the current crisis and examine the facts. 1. HAMAS will not recognize Israel's right to exist. 2. HAMAS fired upward of 200 rockets into Israel BEFORE Israel retaliated. 3. HAMAS won the election in GAZA and set the present course of attacking Israel. 4. Israel gave up land for peace in 2007 when they relinquished GAZA to the Palestinians. The mortar and rocket fire began as they were leaving.... so much for land for peace. Israel gives up the land and they get NO peace. 5. Egypt's Moslem Brotherhood has declared Jerusalem will be the capital of the United Arab States. Our news media avoids and perhaps deliberately obfuscates informing the American people of the facts. I show a clip from an Arab news outlet showing the fiery Imam, Higazi at a rally for now elected Egyptian president Morsi. Higazi is telling the thousands of people gathered there, Morsi will liberate GAZA. Next there is a song whose lyrics declare ; it's time to wake the sleep from the eyes of the Jews. Higazi then proclaims Jerusalem will be the capital of the United Arab States. I ask for a show of hands of how many people in the audience have seen the clip. I get a few hands raised, but the other 99% of the folks have never seen this. The American people have the right to see for themselves the underlying, overwhelming hatred of Israel and the Jews. Without seeing this, current events can and are being spun to placate the Palestinians and make them look like victims. In closing todays post: Please take a moment and watch the video I linked to and see for yourself the unmitigated vitriol aimed at Israel and the Jews. Israel has the right to exist and if she does not then neither does, Syria, Lebanon, Jordan and Iraq as all of these countries were formed after WWI. It is unconscionable that the American people have not seen the video above and so remain in the dark as to the real intent of the Arab states who surround Israel. Now we see this hatred spreading to other countries. Please forward this link so people can see for themselves, the unedited, real intent of Moslem Brotherhood and HAMAS.